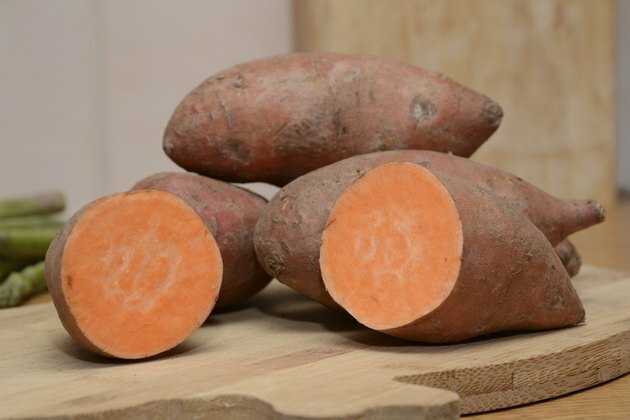 Sweet potatoes are rich in vitamin A, dietary fiber and potassium. With the right toppings, a baked sweet potatoes can be a healthy alternative to sweet potato casserole or pie made with sugar and butter. You can have baked sweet potatoes as a side dish, as a component of a main course or for a snack. Top your baked sweet potato with a source of lean protein, such as cooked lean ground turkey, canned tuna or cooked black beans. These sources of lean protein are lower in unhealthy saturated fat than fatty meats such as bacon. Give the meal a Mexican flare by topping your baked sweet potato with cooked, shredded chicken breast seasoned with chili powder and cumin, sliced avocado and salsa. Serve the baked sweet potato with a green salad to complete your meal. Topping your baked sweet potato with sour cream adds cholesterol-raising saturated fat without many essential nutrients. To eliminate the saturated fat, add nonfat plain Greek or regular yogurt as a topping instead of full-fat sour cream. Low-fat cheese is another healthy topping because of its protein and calcium, which helps build strong bones. Try topping a sweet potato with low-fat feta cheese and spinach, or add low-fat Swiss cheese and cooked mushrooms to a warm sweet potato. Chopped pecans, walnuts and other nuts are crunchy sources of dietary fiber, heart-healthy fats and vitamin E. Add pecans, cinnamon and cooked pears to baked sweet potatoes to make a healthy alternative to traditional sweet potato casserole, which contains sugar and butter. Another option is to top your potato with low-fat blue cheese, grilled cut asparagus spears and chopped walnuts. A flavorful combination to try includes pine nuts with tomatoes and low-fat Parmesan cheese. Chili is a standard topping on baked potatoes and sweet potatoes, but it can be high in calories and saturated fat if it contains regular ground beef. Make a healthier edition of chili using extra lean ground turkey and increasing the quantity of beans, tomatoes and other vegetables. Top the baked potato with chili and fat-free plain yogurt. Steamed broccoli florets are common nutritious additions to baked sweet potatoes. Try new vegetable combinations, such as ratatouille with roasted eggplant, bell peppers, zucchini and fresh thyme.